In this expansion/campaign for Arcadia Quest or Arcadia Quest: Inferno, players will find their way to the heart of the Magic Gardens of Arcadia to face Vexia, the pet-loving witch, and her pack of mutant animals. To undertake this unprecedented campaign, the Heroes will receive loyal help from the most adorable companions: the Families! 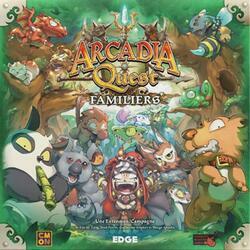 This expansion introduces a new major element in Arcadia Quest in the form of Families. These cute little creatures can follow your Heroes across the board or scout their side, using their unique abilities to help their masters and hinder their enemies. Face the Wild Families in the hope of capturing them and adding them to your Guild. Give your companions levels of skill and improve them with Family Objects to make them even more skilled. No game master is required. Become the ultimate Guild by recruiting Heroes (thanks to the arrival of nature's friends Oak and Vertecapuche) and using your flair to find loot and establish unstoppable combinations! Embarking on a quest becomes much more fun with the addition of the Familiers! Arcadia Quest: Inferno was funded on the Crowdfunding Kickstarter (See the campaign) platform on the 09 December 2015, the campaign lasted 22 days. 9,991 people helped funded the game, whose the amount requested was $100,000.00. Thanks to these 9,991 people the game could be funded up to $1,710,713.62, ~1,710.71%. Be careful this game is an extension of Arcadia Quest: Inferno ... + 1 more+ 1 more and cannot be played alone. To be able to play it you must have a copy of the game Arcadia Quest: Inferno ... + 1 more+ 1 more.